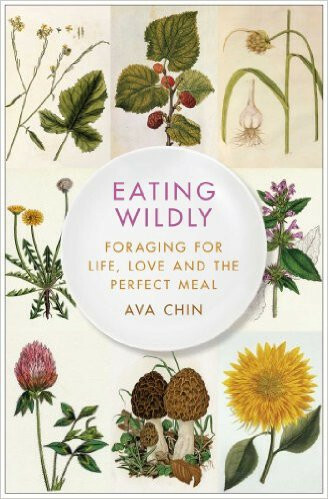 Last week I read a delightful book called “Eating Wildly.” Ava Chin, who used to write a column called “Urban Forager” for the New York Times, tells us about her foraging for wild edibles in Brooklyn. Her adventures in the field are entwined with tales of her Chinese American family and her love life. She not only shares the joy of discovering wild food sources (and love), she shows us how she turns it into yummy meals (and family). The result is a memoir that is charming and instructional at the same time. One of the issues she runs into: Some Times readers (and the occasional bureaucrat) inform her that foraging in local parks is not cool and/or not allowed (though the National Park Service does allow it). They say this even though the people foraging are usually careful to harvest in a sustainable way — after all, most hope to return and forage again in the future. It struck a chord with me because for the last few weeks I’ve been foraging off my neighborhood’s bounty. There’s an apparently abandoned apple tree one block over with apples that are just falling and getting piled up with the fallen leaves. They have a few tiny sooty blotches on them, but they taste wonderful. So I’ve often paused in my walks to pick apples from the branches overhanging the road and stuff my pockets. Saturday morning I woke up thinking of apples and pears, then went off to my urban church to help offer free day-old Panera bread to our needy neighbors. (Panera gives all its leftover baked goods to charity at the end of each day.) I suppose that’s a form of urban foraging, too. 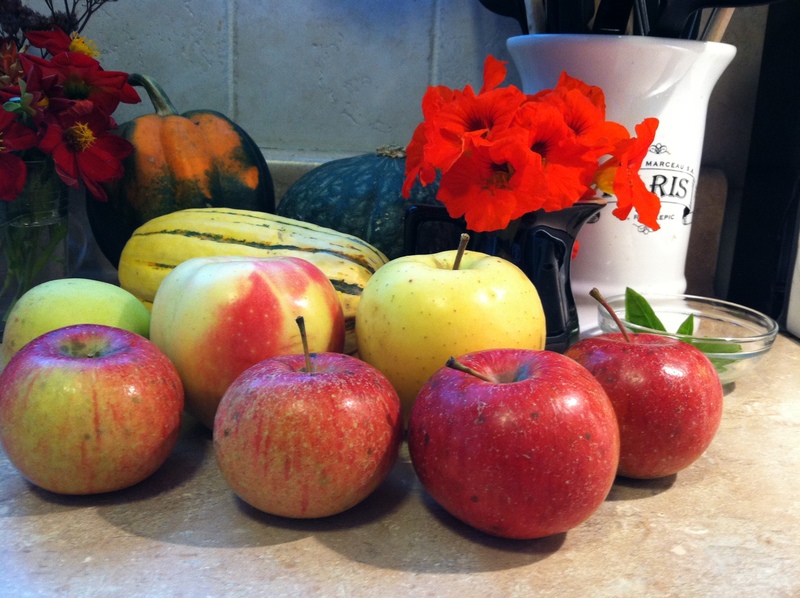 I probably should have tracked down the owner of the apple tree, and asked if I could do some serious picking for my church’s food ministry. Maybe next year. This reminds me that at a “community conversation” on hunger I attended recently, a fellow told a full auditorium that he never bought food because he could get everything he needed dumpster diving. I’m not sure anyone saw that as a particularly helpful suggestion, but I don’t doubt that it’s true. An enterprising soul probably could survive pretty well eating out of our city’s dumpsters. Ideally, of course, more could be done with good food before it ends up in dumpsters. Hunting food in parks and roadsides and yards isn’t necessarily more dignified than staking out dumpsters — or seeking out charity — but what you find actually growing is often really great to eat — fresh and full of flavor, and healthy, too. Why not forage widely for ideas as well? We all consume food, but many of us also consume books. We could stick to bookstores or chain stores or the local public library for our book reading, and do quite well. But readers who are especially adventurous also forage out there in the wild — among the indie authors and publishers. And yes, some of what we find out there might be the equivalent of spoiled food, or poisonous mushrooms (best not to guess with them — Chin makes that clear), so it pays to examine every new find carefully. But some of it may be great. Some of it may be tarter, sharper, more incisive, or just more our thing than the committee-chosen, market-driven products of traditional publishing. Of course, whether you forage for food or ideas, you’re going to get some other folks giving you grief about how you’re going to ruin everything for everyone. What if a dog peed on that? The park will be destroyed! There won’t be any day lilies left! Bookstores are dying! You’re ruining literature! And, of course: Ewwww! But I suggest you look more carefully. There might just be a great meal out there. I was a little startled to realize, last night, that Thanksgiving looms pretty large in both my books so far, and serves as a significant turning point in the first one. This surprised me a little because I’m not exactly a stickler for holiday traditions. My son and I are happily joining friends for Thanksgiving dinner at a restaurant. Although I regret not being with either my grandkids or my brothers’ families today, I have a little bit of a cold and I am actually very content not driving long distances in uncertain weather, or cooking and cleaning. These are not the most significant parts of the Thanksgiving events in each book — I don’t want to spoil anything major — but I thought you might enjoy these little excerpts in honor of the holiday. As Thanksgiving approached, the food pantry got hectic. November was prime time for food collections and for new volunteers, who naturally expected to be given something to do. The generous Thanksgiving boxes, a point of pride and competition among the local churches and civic organizations, had to be organized so that frozen turkeys didn’t defrost, stuffing mix didn’t expire, pies didn’t get squashed, and no one got lost trying to make deliveries. Mary organized driving maps along sensible car routes for the approximate number of volunteers they expected to show up on delivery day, the Sunday afternoon before Thanksgiving. She and Annie supervised the distribution of lists and boxes. She had just finished checking off one set of boxes into the care of a couple of Catholics, when she turned to find herself facing Winslow. “I’m sorry to hear that. Here are their boxes” — she walked him over — “and this is where to deliver them.” She handed over the packet with a tight smile. “Tell your Dad I hope he feels better.” She stepped back, anxious to avoid further awkwardness. “No, not me.” She patted her belly. If he had ever found her attractive, he must be safely past that now. Perhaps that explained the sudden willingness to talk to her again. “My sister’s arriving tomorrow,” he said. “No.” He frowned and shifted the heavy box over to one hip. She suddenly realized how far she’d overstepped. There went her face, burning again. “Sorry,” she said wretchedly. “Dumb suggestion.” She turned away, blinking back tears of embarrassment, and stumbled over to another volunteer who looked like he needed direction. Out of the corner of her eye she could see Winslow staring after her. She turned her back and tried to focus on the man in front of her, who was geared out as if he were about to go climb Mount Monadnock. “Hey, are you okay?” the man asked. Thankfully, the Unitarian boxes were on the other side from the God’s Chapel on the Hill boxes, over by the Kiwanis boxes. Perhaps Annie had mapped out the boxes by dogma, or lack thereof. Mary helped the Unitarian fellow and then hovered while he carried out one heavy box at a time. Winslow came in and out, too, loading his own boxes. She sensed him looking over at her, but carefully avoided making eye contact until his last box was gone and him with it. Then she checked both sets of boxes off her list and collapsed into a folding chair. “You okay?” Annie asked, panting a bit herself. Mary just shook her head. “Home girls?” Lawson was not exactly a hub of hip urban street culture. He arrived at three. He hadn’t really wanted to be that punctual. But he’d taken a shower, and shaved, and changed, and changed again. And then he couldn’t think of anything else to do, and it was still only 2:30. It occurred to him that he should take something, so he drove to Stop n’ Shop. It was closed. He tried the package store. It was open, of course. He bought a bottle of wine and felt like a grown-up. Elaine hadn’t even had to tell him to do it. “Happy Thanksgiving,” he said, and handed over the wine. “I think maybe anything goes with turkey,” he said, as if he had a clue, which he didn’t. Elaine would have known what wine went with turkey, or she would have asked the guy in the package store. David sure as hell wasn’t going to ask. Colin looked unsure whether that was a dig or not. David hadn’t intended it as one, but he enjoyed setting Colin back just a little anyway. “Sounds like fun,” David said. Colin had already said some variation on this to him at least once a week since he’d met him. “Are you watching the game?” he asked hopefully. He had no actual interest in the day’s games, but having a television on would reduce the pressure to have conversation. “So where’s Molly?” he asked Cassandra, who looked as if she’d had just about enough of Colin. “At a football game.” She sounded tense. “You see?” Colin says. “More madness. And on a day like this.” He gestured outside, to where the snow was falling more heavily. “I hope he knows how to drive in this stuff,” Cassandra said. “Steven. Steven Bishop. A guy she used to know at the local high school. He looks nice enough.” Cassandra didn’t sound too impressed. “Wine, please.” Yes, by all means, give him a drink. Had she invited him over here on purpose to make sure he knew about Steven? Maybe this was Cassandra’s way of saying it’s over, pathetic man, get on with your life. He was glad he’d already downed that first glass when a beat-up old Plymouth pulled up outside. “I think she’s home,” he said. But she didn’t come in right away. No, she stayed out there in the car with Steven. Finally, Cassandra opened the door and stepped out onto the stoop. Molly got out of the car. She tried to neaten her hair. She looked so excited and happy. She practically bounced through the accumulated snow to the door. Despite the ache in his heart, David found it impossible not to think: This is good. This is right and proper. Look at her, isn’t she beautiful? When she saw him, though, some of that animation drained away. She licked her lips nervously. They looked chapped. Her entire face looked rough and red. He could remember kissing like that, centuries earlier, back when kissing alone was amazing. “Hello, Molly,” he said, and smiled bravely. “How was the game?” Cassandra asked. FYI — The price on The Ribs and Thigh Bones will rise after it’s released Dec. 9, so pre-order before then to save a dollar. Or pre-order because you want to help me make it more visible to other readers (pre-orders really do make a BIG difference). Or … don’t worry about it and go eat some turkey. It’s a holiday! Hope you have a nice one. A couple of years ago I was reading a cookbook I had borrowed from the library and there was an interesting seafood recipe that referenced a “corn meal bath” on another page. I went to that page … or, rather, I tried to. The page was gone – expertly razored out. Browsing further, I discover at least 10 more pages missing. This was not the first time. Other cookbooks I’d borrowed from the library had been pilfered in this way too – sometimes even new books still on 14-day loan. The pages had always been removed very neatly. This particular thief must read with an X-acto knife sitting nearby. I still wonder – was it so inconceivable for this person to make some twenty-five cent photocopies? Copy down a recipe? Buy a copy of a book? Why must this person steal from the public library, rendering the book incomplete for anybody else? How did this person come to feel so entitled? I sometimes also run into this at the thrift shop/food pantry where I volunteer once a week. We sell donated items in order to fund the food pantry, which exists to provide food for the hungry in our community. Most of our items cost a dollar or two. It may be the best deal in the entire Northeast. Yet there are certain customers who find it offensive to pay even that little. They have their own little systems for obtaining what they want for free. One likes to dump the clothes she wants in the dressing room or the elsewhere in the store, buy one small item, then come back through another door and grab the rest. Some brush things into their pockets or bags, or stuff them under their coats. They open their bags on their way out and add more to them. They do this in front of their own kids, sometimes. Heck, their kids do it, too. Sometimes they come in pairs – larcenous friends like to shoplift together, apparently. One woman stalks quietly around the shop, her pretty face deformed by a permanently suspicious expression. She always seems to think that what we ask for an item is too much, on the occasions when she buys something instead of stealing it. But of course she thinks we’re out to cheat her – she probably assumes the rest of the world is just like her. I also can’t get over the guy who used to use our dumpster as his free trash service. He’d come in and buy something small – a book, a gadget. He’d spend maybe fifty cents. And just about every time he came, there was suddenly a bag of kitchen garbage in our dumpster. I caught him in the act once and stopped him and explained to him how much the dumpster costs us (hundreds of dollars a month). He was extremely contrite. But he went right back to doing it. This was a guy who owned two houses and a brand-new truck. But he felt entitled to steal trash-dumping from an operation that exists solely to feed the hungry. But there’s another area where things can get dicey. Most of our clients are truly in need. Most are very grateful. They may be temporarily disabled, or working low-wage jobs, or between jobs, recently divorced, or suddenly supporting grandchildren or elderly parents. They won’t show up until they really need it. Some volunteer themselves. Some struggle to find stuff they can donate to us. Sometimes they watch greedily while we pack their groceries and ask for this rather than that, do we have any coffee, what about pet food, what about toiletries, what about ______? They call up and say their friend got a ham, why didn’t they? They never miss signing up for anything they can get, from Thanksgiving dinners to Christmas presents. The great temptation of volunteering in an organization like this is to begin to suspect everybody of scamming you. And if that happens, you become pinched yourself – grudging with the food, hostile to well-meaning people who donate stuff that just isn’t salable, curt with customers. You burn out. If the organization is lucky, you take time off, or quit. If it isn’t, you make everybody else miserable. Christian though I may be (multiple coats aside), what keeps me going best when I am tempted to give in to cynicism is a little scene in a trilogy of novels by Thalassa Ali that she set in Victorian India (future Pakistan). In one of these novels, when an especially observant child in a Sufi family asks the family matriarch why they must give alms when many beggars don’t truly deserve help, she tells the child that God may also give her something she doesn’t deserve. Think about that: God may also give us something we don’t deserve. I find that very useful and sobering to reflect upon whenever I start getting snarky about some of the less grateful or deserving recipients of charity. After all, we all need charity of one kind or another, even if it’s just the charity of being loved despite our faults. So I thought I’d share it. Maybe it’s a concept that will help you, too. When I first published The Awful Mess I maintained a fundraising page for Feeding America (which helps support the Regional Food Bank of Northeastern New York, from which we get a great deal of our pantry’s food, as well as logistical support). I did this partly because the heroine of my first novel The Awful Mess depended on her neighbors for her survival — and embarrassed me by doing more for the hungry of her town than I was doing. I still volunteer, but I give my donations differently now, so they can be matched. You can do that, too (or find a food pantry, if you need one), at Feeding America.